The flâneur is the quintessentially masculine figure of privilege and leisure who strides the capitals of the world with abandon. But it is the flâneuse who captures the imagination of the cultural critic Lauren Elkin. In her wonderfully gender-bending new book, the flâneuse is a 'determined, resourceful individual keenly attuned to the creative potential of the city and the liberating possibilities of a good walk.' Virginia Woolf called it 'street haunting'; Holly Golightly epitomized it in Breakfast at Tiffany's; and Patti Smith did it in her own inimitable style in 1970s New York. 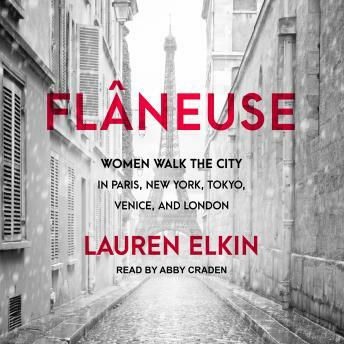 Part cultural meander, part memoir, Flâneuse takes us on a distinctly cosmopolitan jaunt that begins in New York, where Elkin grew up, and transports us to Paris via Venice, Tokyo, and London, all cities in which she's lived. We are shown the paths beaten by such flâneuses as the cross-dressing nineteenth-century novelist George Sand, the Parisian artist Sophie Calle, the wartime correspondent Martha Gellhorn, and the writer Jean Rhys. With tenacity and insight, Elkin creates a mosaic of what urban settings have meant to women, charting through literature, art, history, and film the sometimes exhilarating, sometimes fraught relationship that women have with the metropolis.